Pompei is a uniquely preserved ancient Roman city, which today represents a huge open-air museum. This one is a unique one of its kind as the ancient settlement is located in Naples Bay in Italy's Campania region, at the foot of the volcano Vesuvius. From there Naples is very close - 22 km northwest. This southwestern part of Italy is located between the famous volcano and the sea which can easily be reached by train or bus from Sorrento or Naples, and the road lasts about 30-40 minutes. 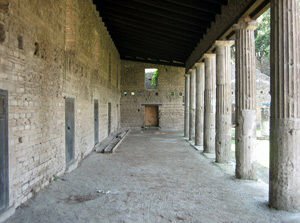 Historians believe that Pompei is the largest preserved ancient city today. It was buried under a thick layer of volcanic ash after the eruption of Vesuvius. From the 79th year in the first century BC the city became a part of the Roman state. The eruption of the volcanoes scattered ashes exactly managed to preserve the city. In the 16th century during the construction of sanitation the workers found the first traces of the ancient city. 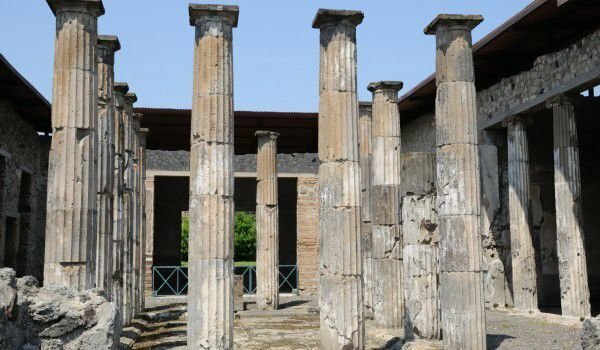 After about two centuries, however, Pompei was fully discovered when excavations bought to light the ancient buildings and petrified bodies in various postures of the inhabitants. Today tourists are open to open to about 65 hectares as more than half of the buildings have been restored completely. The dimensions of Pompei are really impressive - its shape is oval, with the composition including 11 towers and 7 city gates, protected by the fortified wall with a length of 3120 m.
Evidence of the boiling political and religious life in Pompei are clear. Here you can see the Temple of Apollo, Temple of Jupiter, the municipal council and the Canopy market court. The southern part of the city is famous for the Triangular Forum with the Doric temple of VI century BC. There are ruins of two theaters, an amphitheater for 20, 000 spectators, which held gladiator fights and three public baths. Quite interesting are the brothels, which was famous in Pompei. They were the main entertainment in the city and as such attracted people from all over the Roman Empire. Today called, Garden of the fugitives you can see 17 castings made from the cavities left by the petrified bodies of the inhabitants of Pompei. Among them you can see people who have even been frozen while making love. Undoubtedly one of the biggest attractions in the ancient city of Pompei are the preserved frescoes, mosaics and paintings on the walls, which transforms bold and curious scenes of daily life of ancient inhabitants of Pompei.